Airspace Explorer is a flight tracking and airspace education app. It has been developed by NATS (the UK’s leading provider of Air Traffic Control services) in partnership with FlightAware (the global flight data provider) and supported by AirTeamImages – the aviation image library. It’s currently in beta format as we are refining and improving it on a regular basis. Airspace Explorer is actually a stripped down version of a more comprehensive app used internally at NATS for situational awareness and operational information. The internal facing app is called ‘Operational Insight’ and includes information and functionality that has been removed in Airspace Explorer (such as that concerning airspace regulations and the majority of military and police flights). We also have a web based flight tracking system which is tailored specifically for use by Airlines called ‘MOS’ (Mission Optimised Services). If you work for an airline and would like to know more about MOS, please get in touch. We decided to release Airspace Explorer, as thought it might be of interest to the general public and help explain how UK Airspace is structured and managed. Our app is similar to other flight tracking apps available on the App Store, but it has some additional interesting features. Airspace. Firstly, in addition to providing information on flights and airports, our app provides information on the airspace itself. We show the Flight Information Regions (FIRs) that comprise the airspace around the world and the controlled airspace structures that make up the FIRs in UK airspace. Play with the app and learn about the difference between controlled and uncontrolled airspace and the different types of airspace structures that exist. You can also see the Sectors that we use in the UK to divide up the airspace and allocate Air Traffic Controllers to manage. Radar data. Secondly, unlike other flight tracking apps, our app includes some UK radar data for showing aircraft positions. We don’t display all of our radar data, as a number of aircraft, such as most military and police aircraft, are removed. Even with aircraft removed, the inclusion of radar helps to increase aircraft coverage and the radar often picks up and displays smaller aircraft that other apps don’t track. 3D view. Thirdly, we provide a 3D view of the airspace. 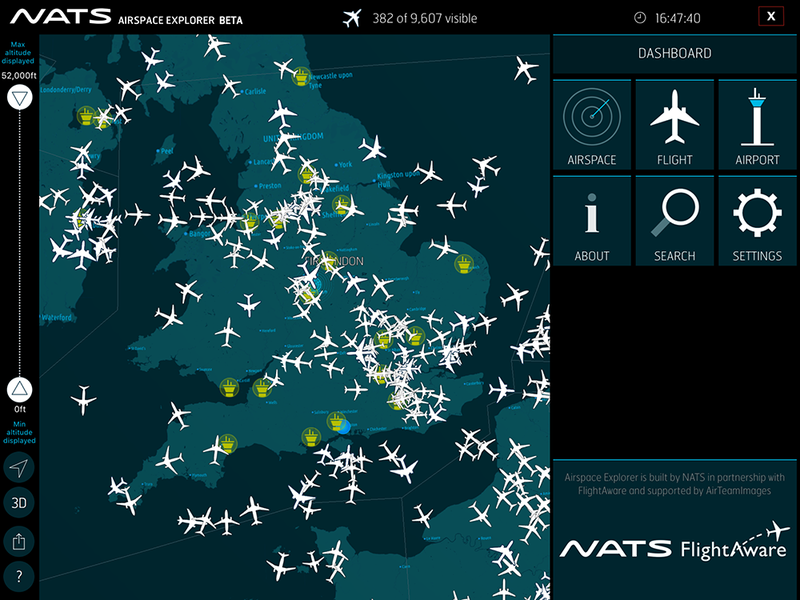 The 3D views help to provide a sense of the relative altitudes of aircraft and the shapes and sizes of the controlled airspace areas in the UK. You can pan, zoom and move around the airspace in 3D and view flight paths in and out of airports to gain a sense of the approach and departure routes the aircraft fly. Please check our FAQs page for more information about Airspace Explorer. Do enjoy playing with the app and please let us know what you think – we’re very keen to hear your views and ideas.